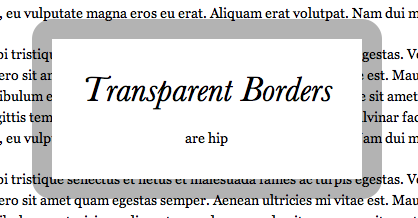 Have you ever seen an element on a page with transparent borders? I think Facebook originally popularized it giving birth to lightbox plugins like Facebox. I don't think Facebook sports the look anymore, but it's still rather neat. 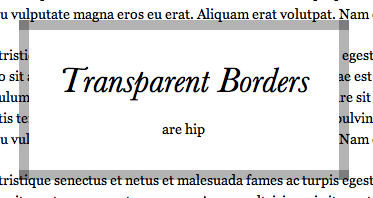 However, setting a transparent border on an element will reveal the elements own background underneath the border. In the screenshot above, the borders use RGBa to be transparent, but they appear solid gray because they are only revealing the solid white background of itself below. So I'm sure you see where I'm going here... if we set the background-clip to the padding-box, the white background will end before the border and the transparency will lay over other content acheiving the look we are going for! In our lightbox example, it's most likely that the background is a solid color. In that case, background-origin is rather irrelevant, as nobody will ever be able to tell where the color "started" from. However, if the background of the element is an image, it can be quite important where the origin point of the background starts. This is related to background-clip, because if the background-clip is the padding-box but the background-origin is left at the default border-box, some of the background-image will be cut off, which may or not be desireable. I only tested these modern browsers and support is good. It may (and likely does) go back a bit further in the non-IE browsers. If you'd more complete browser compatibility, you can always go with the double-div method. 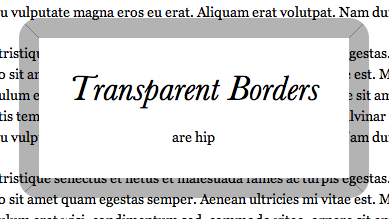 Another advantage to the double-div method is that you could achieve truly rounded borders. Unfortunately with the background-clip method, the outer border is round but the edge of the background stays straight-cornered. 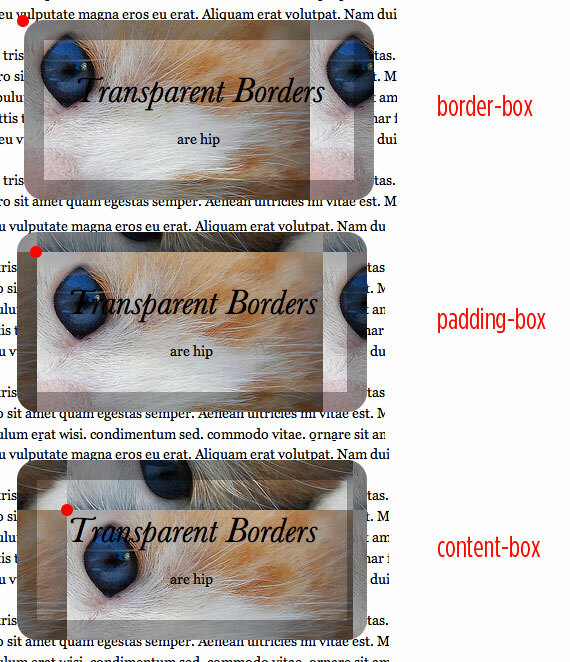 20px of border was fine, but when I tried 30px, these mini boxes of death showed up in Safari 5. 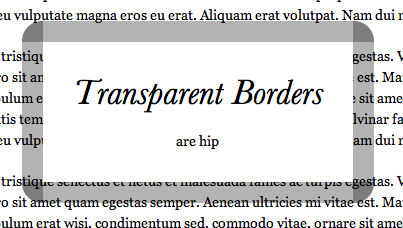 In Chrome, little diagonal lines were present at any border width up to 20px. Above 20px border, the corners completely darken. Without border-radius, darkened corner boxes are always visible. Thanks to Alex Hall for the original idea and help. Great article, and the tip will certainly come in handy! The last two screenshots, I assume are related to the one above them. Meaning that the last two are in Chrome. Just wanted a little clarity. Beautiful. Crazy that I was just trying out rgba yesterday and wondering why the hell transparency didn’t work. Do you have a screenshot of what this looked like in IE 7/8? In IE8 the border is solid. This is a really cool idea. I could think of display data linked via text i.e. a dictionary definition, photo details etc. Unfortunately IE is left in the dust with these cool visual styles. However I’ve stumbled across PIE CSS3 for IE! This allows support for RGBA value and other CSS3 properties. I haven’t had a chance to test it out myself, but I’m working on it and looking forward to it! Chris, to solve the inner corner not being rounded, set the border-radius to twice the size of the border. The same CSS came to my mind. Why not use border, RGBa color und border-radius? But at the moment that breaks Gecko, so best to use separately. Ahhh, that’s good to know. I was unaware that the box-sizing values were available to use in the background attribute. In my example I’m using *just* background: #fff and it works fine? 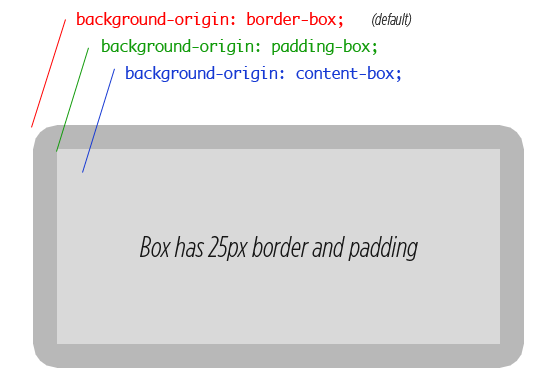 You also specified padding-box in the background attribute, which I was unaware of until Christ mentioned it above. Good idea though, both of you, I will indeed remember this! Chris, not christ. Sorry about that, Chris. I’m just so happy that IE9 is supporting all this. It’ll make our job easier. Would the use of outline rather than border not overcome this problem? However, I realise that outline would not permit the coolification by addition of radius. However, I found that it was actually easier to use border because the outline property did some weird things, like sitting way outside the region of the element! FYI Facebook didn’t develop Facebox. he said he thought FB originally started the “transparent border” thing (I’m not sure either), which led to things like Facebox. As a side note. From working with Chris I can tell he takes great lengths to study every aspect of something before he writes a tutorial on it so almost everything he teaches is the best way to do something too. This site is a great resource for web designers and developers..I just Loved it! thank you Chris. Nice tips; though I think that using a double div with a transparent png border might be more graceful on IE; the RGBa value being the problematic property. With a PNG double div you’ll at least retain the transparent effect, but keeping graceful degradation in mind you could do some very slick looking modals in this method, or :focus and :hover effects. I am with this idea. Chris’ idea about the transparent border is freaking awesome, but to bleeding edge for sites that have heavy legacy users. but I just don’t understand what the big deal is, and what transparent borders would be needed it anyways?. Transparencies are the new drop shadows. That’s all. 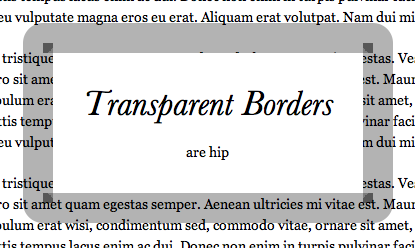 Really neat trick, I had been trying to get transparent borders on a lightbox I am developing… Another possible route I was trying is a transparent div as the parent… it also had the bonus of having rounded corners inside of rounded corners. After going over this a few times, I’ve got to say, there is just way too much cross-browser weirdness going on there..
Here’s my version. Works in IE6+, FF, Safari, Chrome. But you’re using three elements to create that one box, the method Chris uses has just one element. However, I realise that this method won’t work on anything but the latest browsers and your version is the cleanest method I could think of that would work across all platforms, so very nice job! Nice explain the background-clip and background-origin by using image. I apologize if my question is irrelevant to the original intent of your article, but if I may ask, what was the original solution Facebook used and did it degrade gracefully? OK this makes a lOT of sense dude. Wow. Thanks for sharing your expertise. I wish there were was a better implementation of this great CSS feature without the developer jumping though hoops. I can already see most designers using the double div method. All I need new is a client who wants transparent borders enough to pay me to do all this? One day! Set that inner white block (blockquote p I believe) to have that stroke’s bg color. Right now it’s picking up it’s default bg or something. CSS getting awesome day by day. What if there is no browser war? Still we need to consider old styles to make sure our web apps has a consistent look among browsers. Some client that much crazy (or we?) like using still ie6. Thanks for the post. As sloppy as it is, for compatibility reasons, could you make two divisions? Not all IE versions will support this, but I guess it could be a simple solution in some cases. very nice indeed! something new to play with. using rgba definitions is better. at last, this is supported by only modern browsers too. I couldn’t find this anywhere so I thought I’d share… This gives a semi transparent border outline around a box while retaining the 100% transparency of the inside box…essentially giving a ‘window’ to peer through the 50% transparency box. 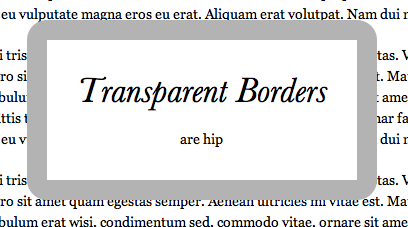 The SASS / CSS (I’ve included the long version of the border for clarity). This uses a white png image with 50% transparency. Quite a few lines of code, but the result is pretty. 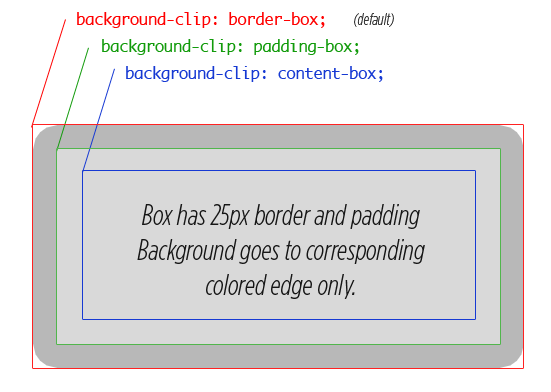 I found that there is a little mistake in the background-origin pic, the default value of background-origin should be “padding-box” instead of “border-box”.